Spring has (fingers crossed) sprung in our little corner of Ukraine, and to Emma and me that means it’s time to get going on our (your) playgrounds! In our last update, we saw that pieces of the playgrounds were starting to take shape in the local workshop. The carpentry crew has been working steadily, and we’re happy to say that just about all the pieces for our playgrounds have been cut and sanded. Meanwhile, Emma and I have been in discussions with Tanya (our primary community partner) and Petro Yuriovich (the mayor), trying to balance our American obsession with planning against what you might call “Ukrainian pragmatism”: who knows what will happen by next week, so figure it out then and everything will work out. Workers put together a bench in the lumber yard behind the workshop. We’ve learned a couple new details and changed plans a little. First of all, it turns out that we need to treat all of the wood with a flame-retardant liquid before we can paint it. Ukrainians traditionally love going to the park and cooking shashlik (grilled meat) over an open fire. 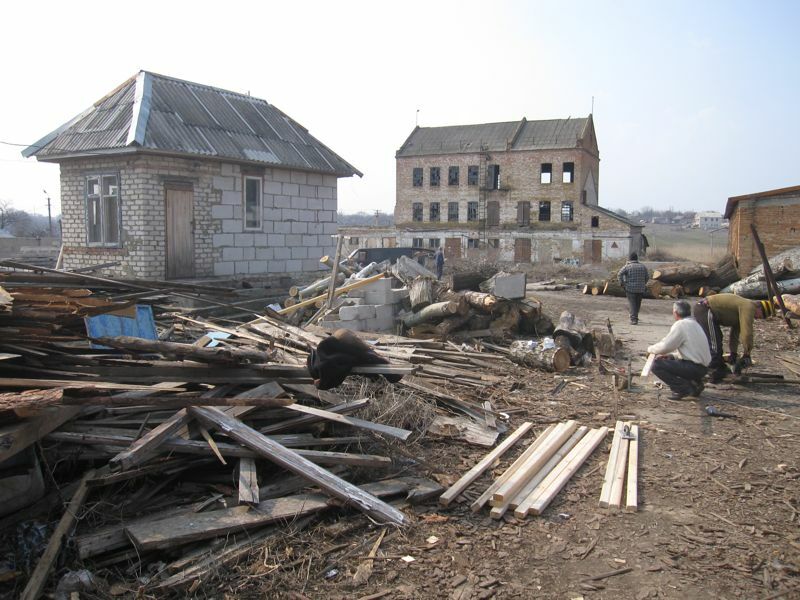 We don’t want some “resourceful” fellow using our beautiful picket fences as shashlik fuel! Secondly, we learned the carpenters are planning to bring the wood to our sites and assemble the playgrounds on-site, rather than put them together at the workshop. So our part in this is now two stages: treat the wood with flame-retardant while it’s in pieces at the workshop, and then paint it after it’s assembled on-site. So, for these last two weekends, we got busy slathering on flame-retardant. We recruited some volunteers from among the students we know at the school and lyceum to help us get it done. We started treating the fences inside, since it was still cold out. 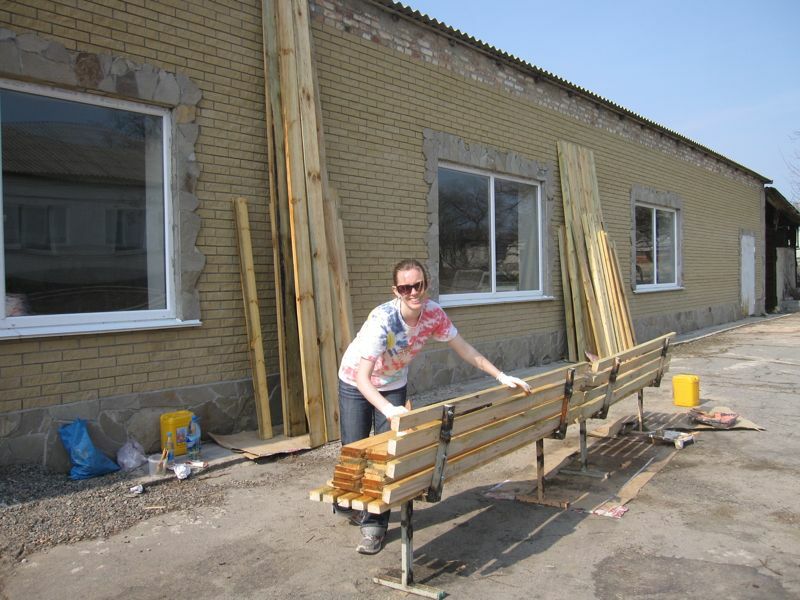 Olya and Carina worked hard to help us finish the fences. Alex wore his iContact t-shirt as a shout out to colleagues who donated. We started last weekend with the little picket fences that will surround the playgrounds. A couple of my star English-speaking students at school, Olya and Carina, volunteered to give us a hand. It was still a little cold outside, so we worked inside the workshop. We had 50 2-meter sections of fence, 20 pickets per section, 4 sides on each picket – and we had to cover it all with the clear liquid. It was tedious, thankless work, but Olya and Carina were real troopers. They helped us knock out almost all the fencing that first day, and then volunteered to come back and finish off the rest after school. The fence pieces were the hardest parts to treat, so we owe Olya and Carina a big thanks for their hard work. Lyceum students and the mayor pose with Alex for an action shot. Those bench legs, by the way, are made of recycled school desks. After the fencing, we mostly just had a huge stack of flat lumber to treat, which we managed to finish off in one long Friday’s work. In the morning, we recruited 6 volunteers from the 2nd course farmer class at Emma’s lyceum: Roma, Kolya, Sasha, Dima, Vitaliy, and Sasha. These guys made swift work of a sizable stack of lumber, so Emma and I were able finish the rest that afternoon. It felt satisfying to finally get our hands dirty (or chemically, I should say), and put some “elbow grease” into this project rather than just the “brain grease” we’ve invested thus far. To see and actually pick up and carry around the giant stack of heavy-duty lumber our friends and family bought with their hard-earned dollars – it makes us really grateful once again for your support. 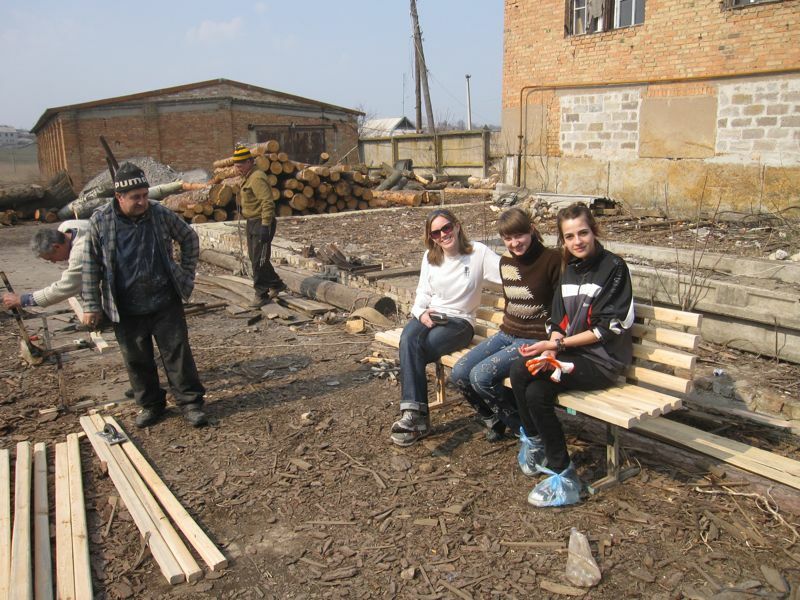 Emma, Olya, and Carina take a break from their hard work on a new bench behind the workshop. We had a lot of heavy-duty boards to treat with flame-retardant. 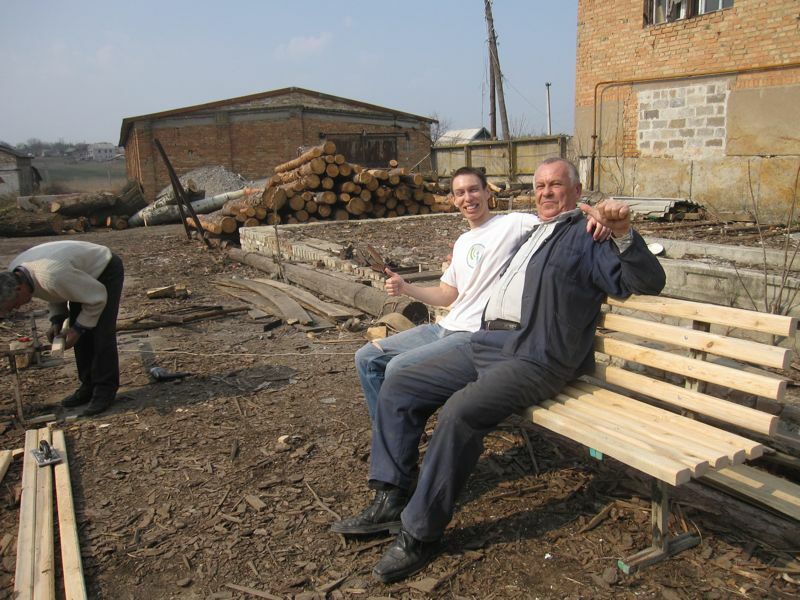 Alex and one of the carpenters share a moment on one of our benches. Emma finishes off the last batch: a stack of roof slats. You can see all our photos of the project in this gallery. Next weekend, weather permitting, we’re planning to install the first playground in our neighborhood! Wish us luck!